Evidence from observational comparative effectiveness research (CER) is ranked below that from randomized controlled trials in traditional evidence hierarchies. However, asthma observational CER studies represent an important complementary evidence source answering different research questions and are particularly valuable in guiding clinical decision making in real-life patient and practice settings. Tools are required to assist in quality appraisal of observational CER to enable identification of and confidence in high-quality CER evidence to inform guideline development. The REal Life EVidence AssessmeNt Tool (RELEVANT) was developed through a step-wise approach. We conducted an iterative refinement of the tool based on Task Force member expertise and feedback from pilot testing the tool until reaching adequate inter-rater agreement percentages. Two distinct pilots were conducted—the first involving six members of the Respiratory Effectiveness Group (REG) and European Academy of Allergy and Clinical Immunology (EAACI) joint Task Force for quality appraisal of observational asthma CER; the second involving 22 members of REG and EAACI membership. The final tool consists of 21 quality sub-items distributed across seven methodology domains: Background, Design, Measures, Analysis, Results, Discussion/Interpretation, and Conflict of Interest. Eleven of these sub-items are considered critical and named “primary sub-items”. Following the second pilot, RELEVANT showed inter-rater agreement ≥ 70% for 94% of all primary and 93% for all secondary sub-items tested across three rater groups. For observational CER to be classified as sufficiently high quality for future guideline consideration, all RELEVANT primary sub-items must be fulfilled. The ten secondary sub-items further qualify the relative strengths and weaknesses of the published CER evidence. RELEVANT could also be applicable to general quality appraisal of observational CER across other medical specialties. RELEVANT is the first quality checklist to assist in the appraisal of published observational CER developed through iterative feedback derived from pilot implementation and inter-rater agreement evaluation. Developed for a REG-EAACI Task Force quality appraisal of recent asthma CER, RELEVANT also has wider utility to support appraisal of CER literature in general (including pre-publication). It may also assist in manuscript development and in educating relevant stakeholders about key quality markers in observational CER. Asthma affects an estimated 334 million people worldwide, 14% of the world’s children and 8.6% of young adults . With such high global prevalence, the affected patient population is inevitably broad and heterogeneous. Such heterogeneity is observed through level of asthma control, severity, various marker phenotypes, and asthma treatment. However, there remains unknown precipitants of future impairment and risk. Healthcare professionals need informed clinical guidelines to help support decision making and to tailor management approaches to the complex needs of the diverse range of patients seen in clinical practice. Current asthma guidelines are developed by experts with the goal of signposting evidence-based approaches that will optimize patient outcomes. Their recommendations are based on a synthesis of the available literature and (reflecting traditional evidence hierarchies) rely heavily on classical randomized controlled trials (RCTs). RCTs have relatively high internal validity and the ability to clearly establish a causal relationship between an exposure and an outcome . This high internal validity is achieved through selective patient inclusion and highly-controlled ecologies of care. However, it also limits RCTs’ external validity and their relevance to real-world care and many routine clinical scenarios [3, 4]. In everyday practice, healthcare professionals often encounter complex clinical, lifestyle, psychosocial, demographic and attitudinal factors; aspects of the real world that are excluded as much as possible within RCTs to maximize their internal validity. The clinical implications of these factors are better addressed through real-life research methodologies—observational studies, pragmatic trials, observational comparative effectiveness research (CER)—which, by design, reflect true ecologies of care and include factors such as gradations of disease severity, diverse patient demographics, comorbid conditions, treatment adherence and patients’ lifestyles. Thus, the questions addressed through RCT and CER research are related yet distinct, each having importance toward improving patients’ health. The integration of robust evidence from both RCTs and real-life CER can provide a more complete picture of outcomes in complex clinical scenarios. A combination of evidence sources better represents the totality of an intervention’s effectiveness and guidelines based on such evidence combinations are more applicable to real-world clinical practice and its many and varied associated challenges. Calls for better integration of a range of evidence sources to inform more holistic respiratory guidelines [5–7] will only be realized if confidence in non-RCT evidence is increased. Inherent difficulties in assessing whether real-life evidence is of sufficient quality to be considered within the context of clinical guidelines has been a barrier to acceptance. Development of a systematic and implementable approach to real-life CER quality appraisal is an important step towards implementing this necessary paradigm shift. Responding to this need, the Respiratory Effectiveness Group (REG) and European Academy of Allergy and Clinical Immunology (EAACI) formed a joint task force to conduct a quality appraisal of the published observational asthma CER literature and, in order to do so, worked systematically to develop a standardized tool for CER quality appraisal (Additional file 1: Fig. 1). This paper outlines the methodology and process that lead to the development of the REal Life EVidence AssessmeNt Tool (RELEVANT). The tool was created to assist the Task Force in identifying CER studies of sufficiently high quality to warrant consideration by asthma guideline bodies . RELEVANT was developed across six key phases between June 2014 and September 2015, including a literature review and synthesis of the existing literature followed by iterative processes for creating a novel tool (Fig. 1). Seeking to integrate the Task Force work within existing quality appraisal activities, a number of publications on quality parameters for non-RCT CER were first identified and reviewed [9–14]. The principles of these publications were chiefly incorporated within two key papers published in 2014—Berger et al. and Roche et al. —which jointly formalize the CER nomenclature and offer recommendations for systematic quality appraisal of observational database studies. Roche et al. —Quality criteria for observational database comparative studies—was a literature-based proposal published by members of REG offering suggestions for the quality appraisal of observational database studies with a particular focus on respiratory medicine. Berger et al’s  Good Practice Task Force Report was developed to evaluate the quality of pharmaceutical outcomes research evidence and was published on behalf of the International Society For Pharmacoeconomics and Outcomes Research (ISPOR), Academy of Managed Care Pharmacy (AMCP) and the National Pharmaceutical Council (NPC). It involved a review of the current literature on reporting standards for outcomes research published prior to 2014 and proposed a number of study design criteria to assist in the assessment of CER within the context of informing healthcare decision making. These two papers were used to identify the quality domains and critical sub-items of these domains that the REG–EACCI Task Force members should incorporate in RELEVANT. The RELEVANT quality domains and sub-items were identified by mapping the components both unique and common to the Berger  and Roche  publications. The mapping enabled a broad net to be cast such that all domains and quality sub-items were captured while also enabling identification of areas of agreement (core concepts) and redundancies (for elimination). A structured taxonomy was developed such that design categories common to both papers were defined as quality “Domains” and within these were labeled “sub-items” (markers of methodological quality). The checklist produced (Additional file 2: Table 1) was reviewed and discussed by Task Force members at a face-to-face meeting as part of the REG Summit (Rotterdam, the Netherlands) in January 2015. The central recommendation was to reduce the number of items in the tool to minimize potential inter-rater variability. It was also agreed that all Task Force members would, remotely and independently, review the individual quality sub-items within the checklist and advise whether sub-items should be kept, removed or merged and the rationale for their recommendation. This feedback was used to item-reduce the checklist for initial pilot testing by Task Force members (Table 1). To pilot the tool and assess inter-rater variability, six papers from the Task Force’s literature review were randomly assigned for appraisal to two Task Force subgroups of nine members, Group A (n = 3 papers [15–17]) and Group B (n = 3 [18–20]). Three of the papers reviewed considered the relationship between adherence and asthma outcomes, and three the relationship between particle size or device type and outcomes. Participant Task Force members were not permitted to appraise papers that they had co-authored; papers were otherwise randomly allocated and reviews carried out independently. Inter-rater variability also described as % rater agreement, was evaluated as the percentage concordance among raters at the individual sub-item, pooled primary sub-item, pooled secondary sub-item and combined primary/secondary sub-item level. For example, for a given sub-item, if four of the five raters deemed this sub-item as a “yes” whereas the remaining one rater deemed this sub-item as a “no,” then the inter-rater variability (% rater agreement) would be 4/5 = 80%. A percentage agreement that approaches 50% suggests large disagreement that is no better than chance whereas % agreement that approaches 100% suggests strong and full concordance across raters. Raters were invited to provide written feedback on usability of the checklist and to identify areas of difficulty in criterion interpretation or application. Potential areas of divergent interpretation were also explored through interactive discussion with two members of Group A to understand the rationale for their differences in opinions where they occurred. The Task Force members next met at the American Thoracic Society Conference in May 2015 (Denver, Colorado, USA) to review the pilot results and enact necessary revisions. Inter-rater agreement was calculated and qualitative feedback invited from participating raters to identify opportunities to reduce inter-rater variability further. Redundancies in sub-items were identified through rater quality feedback and deleted. Task Force rater feedback also recommended that secondary sub-items remained hidden until fulfillment of all the primary sub-items is confirmed in order to streamline the review process and avoid time being spent qualifying more subtle aspects of papers that may ultimately fail to meet the minimum requirement for guideline consideration. A wider pilot of the refined checklist (Additional file 1: Table 2) was recommended to allow involvement of a larger number of raters (≥ 20) and to assess the impact of the implemented revisions and tool simplification on inter-rater agreement. Twenty-two participants were identified for the extended pilot via an open invitation emailed to all REG collaborators and members of EAACI (Additional file 1: Table 3). Six papers from the Task Force’s CER literature review were selected for appraisal [21–26] and assigned in pairs across three rater subgroups (Groups A [n = 7]; Group B [n = 8]; Group C [n = 7]). There were two papers on the relation between adherence and outcomes, two on the relation between persistence to therapy and healthcare resource utilization and two on the relation between particle size and outcomes. Raters were asked to review the papers independently and to use an Excel-based version of the tool to record checklist fulfillment for each paper and then to return these to the Task Force coordinator via email for collation. A one-page user guide was developed to ensure all participating raters received (or had access to) standardized instructions as to the use of the tool. As in the earlier pilot, raters were not allowed to review papers they had coauthored. Allocation of papers was otherwise random. As before, calculation of inter-rater variability (percentage agreement) was defined by consistent ratings (all raters scoring the same paper ‘Yes’ or all ‘No’) at a per-criterion level for each paper. Agreement results were then estimated for each paper at the item-, domain and global (all primary sub-items) level within each rater group and in sum across all rater groups. The results of the pilot were reviewed by the Task Force members at a face-to-face meeting at the 2015 European Respiratory Society Conference (Amsterdam, The Netherlands). Further qualitative feedback was invited from pilot raters to identify remaining opportunities to remove redundancies, potential ambiguity and associated inter-rater variability. The Task Force members implemented final rephrasing recommendations from the Phase V pilot and approved the tool for use for the primary Task Force CER literature review . To aid ease of RELEVANT implementation for the wider Task Force literature review , an online version was developed using Google forms. The conversion of the tool to an online format minimized the potential for data mis-entry and incomplete data capture by use of drop down lists and questionnaire logic. Mapping the quality recommendations within the primary reference papers Berger et al. and Roche et al. resulted in an initial 43-item checklist (Additional file 2: Table 1). Implementation of the Task Force members’ recommendations for item-reduction narrowed the tool items to 25 quality sub-items distributed across seven core quality domains (Table 1). Evaluation of inter-rater agreement of the initial tool indicated wide variation (50–100%) in concordance across individual sub-items: < 60% for 8 of 25 sub-items; 60–67% for 10 of 25 sub-items and ≥ 80% for 7 of 25 sub-items. Domain-level agreement was similarly varied (50–100%). The qualitative feedback suggested this variation was largely driven by differences in semantic interpretation of some of the sub-items and could be addressed by further removal of any redundancies and careful rephrasing and further, e.g. eliminating subjective words (replacing “relevant” with “justified”) and splitting “double-headed” sub-items into separate, discrete sub-items. The 22 raters involved in the extended pilot came from a wide range of countries (> 10) and included members of the REG collaborator group, EAACI Asthma Section Members, Global Initiative for Chronic Obstructive Lung Disease, Global Initiative for Asthma, the American Thoracic Society and the European Respiratory Society (Additional file 1: Table 3). Inter-rater agreement of the version of the tool used for the extended pilot found concordance in excess of 70% for 94% of primary sub-items and 93% of secondary sub-items (Table 2). When compared across the 3 groups (A–C), agreement on the primary quality sub-items varied from 64–100% to 55–100% for secondary sub-items. Qualitative feedback from the pilot raters identified some remaining sub-items in the tool that could be further simplified to reduce potential inter-rater variability. Raters frequently commented on the ease of use of the tool, but noted the recurrent challenge of a lack of necessary information in the papers under appraisal. The Task Force members implemented the final rephrasing recommendations and finalized the checklist, with 21 items, as “RELEVANT” (Table 3). 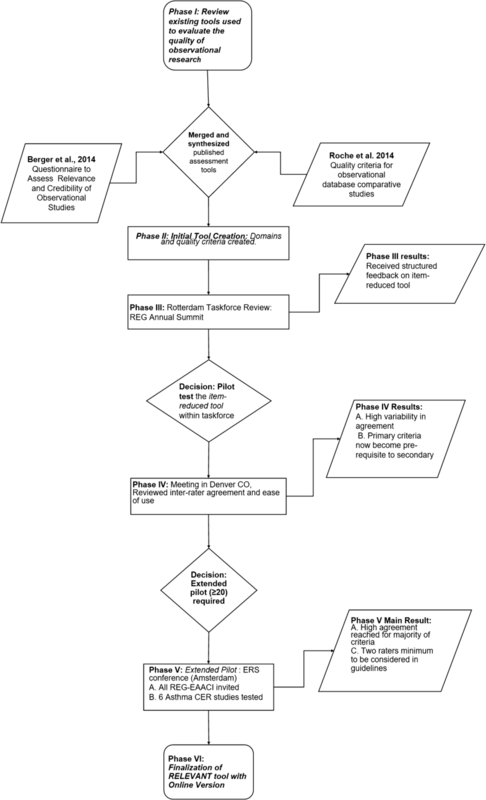 The final tool—RELEVANT—guides systematic appraisal of the quality of published observational CER papers across seven domains: Background, Design, Measures, Analysis, Results, Discussion/Interpretation, Conflicts of Interest (Table 3). Raters must indicate fulfillment (Yes/No) of 11 quality sub-items across these seven domains, e.g. Background (Domain 1), Criterion 1.1: “Clearly stated research question” (Yes/No); Conflicts of Interest (Domain 7), Criterion 7.1: “Potential conflicts of interest, including study funding, are stated” (Yes/No). “RELEVANT quality” is defined as fulfillment of all 11 primary sub-items. Failure to meet any one primary criterion reflects a potential “fatal flaw” in a study’s design or, if failure reflects absence of the necessary detail, a lack of sufficient transparency in reporting. A fatal flaw is a concept defined by Berger et al. as an aspect of the: “design, execution, or analysis elements of the study that may significantly undermine the validity of the results . If all primary sub-items are fulfilled, assessment of ten additional, secondary, parameters is prompted to enable further characterization of the relative strengths and weaknesses of the paper . This is the first practical tool specifically developed to assist in the appraisal of published observational CER with the purpose of informing asthma guidelines and supporting decision-makers. Rater agreement was assessed in two pilots with the second, broader pilot returning robust results, reflecting the value of using Task Force expertise and early pilot rater feedback to revise the tool iteratively. We acknowledge that other tools such as the Grading of Recommendations, Assessment, Development and Evaluation (GRADE) exist for rating the quality of the best available evidence . However, existing tools such as GRADE automatically downgrade observational study designs and upgrade randomized designs with the primary intent toward informing the quality of efficacy signals. The purpose of RELEVANT is more specific in that it focuses on observational CER studies that can potentially inform asthma guidelines and decision-makers. Further, RELEVANT attempts to weigh the benefits and harms of internal versus external validity, a domain lacking from GRADE and other tools that prioritize randomized designs and efficacy signals. Thus, within the specific case of real-world effectiveness study quality, broad tools that emphasize efficacy may not be fit for purpose. RELEVANT enables quality appraisal of the published literature and so complements existing quality checklists, which have traditionally focused on quality markers for protocol and manuscript development and from a largely empirical (rather than practical/applied) perspective. Initial drafts of the tool used wording from the previous quality assessment literature, but the pilot work revealed the potential for misinterpretation unless very precise language was used and each criterion had a singular and specific focus. Refer to the Roche and colleagues companion manuscript for clinical applications and evaluations that use the RELEVANT tool . RELEVANT was developed to assist clinical experts and guideline developers in appraising observational asthma CER study quality. Used in combination with other tools such as the GRADE, RELEVANT can help facilitate critical appraisal of observational studies as well as pragmatic trials and so contribute to a broader appraisal of the available asthma evidence base. It is a time efficient and user-friendly method of quality assessment and has potential utility as a teaching aid, manuscript development guide or as a tool for use by journal peer reviewers. Indeed, any researcher or clinician with the ability to critically read CER (e.g. basic knowledge of confounding in observational research) should find the tool self-explanatory and potentially useful as a publication checklist as well as a framework for literature appraisal. RELEVANT development was an ancillary (although necessary) step towards completion of the original Task Force’s objective of conducting a quality appraisal of the observational asthma CER literature. As such, a quasi-pragmatic rather than entirely systematic and externally validated approach was taken. All primary and secondary sub-items featured in the tool were felt to be important (within the literature and by Task Force members), but expert opinion was used to differentiate between primary (mandatory) and secondary (complementary) sub-items to ensure RELEVANT was comprehensive but also relatively concise to aid in successful practical implementation. The final categorization was based on frequency of reference within the prior literature and on Task Force member consensus judgment. Prioritization and categorization of the primary/secondary sub-items within the checklist could be revisited and adapted for other purposes, as appropriate. While RELEVANT is intended as a tool to assist in the quality appraisal of observational CER, RELEVANT assessments are influenced by the quality of reporting of the research as much as the by the inherent quality of the study itself. While this may result in an under-estimation of the quality of the published work (e.g. dismissal of a paper owing to a failure in reporting rather than in the research methodology) the Task Force members felt this was unavoidable. An alternative approach could involve contacting each author group and offering them the opportunity to provide more information where a quality limitation resulted from a lack of available data, but there was insufficient Task Force resources available to permit this approach. This emphasizes the need for accurate and comprehensive reporting and the interest of protocol registration. While development of RELEVANT sought to remove subjective interpretation of the quality sub-items, the rater’s appraisal of the fulfillment of the quality markers is unavoidably open to rater opinion and judgment. In turn, the appropriateness of such judgment is inherently affected by raters’ experience and expertise with respect to observational CER. The majority of raters involved in the pilot work, however, were members of REG—a group that has a particular focus on real-life research methods—and so most participating raters would have had substantial prior knowledge and/or involvement in CER. This may have contributed to the high inter-rater agreement recorded especially during the extended pilot testing. There is a need for moderation in the recommended potential uses of the checklist tool to avoid it being widely adopted for purposes other than those for which it was designed. However, there are also potential opportunities to use the tool in training exercises to educate fellows, journals editors and reviewers as to what constitutes quality in CER. If the tool were introduced within graduate-level training, it may also have the potential to help shape and inform the design of more appropriate observational CER in the future. RELEVANT is a user-friendly quality appraisal tool comprising 21 quality sub-items (11 primary; 10 secondary) across seven core quality domains. It was developed to support quality review of observational asthma CER for the purposes of the joint REG-EAACI Task Force literature review, but is also now used among Task Force members to support their peer review activities for respiratory journals and to guide the development of their own research papers. It is the first of its kind to support quality appraisal of published research and to have been developed through iterative feedback derived from pilot implementation and inter-rater agreement evaluation. RELEVANT can be downloaded in Excel or pdf format from the REG  and EAACI  websites for use by guideline developers, researchers, medical writers, and other interested parties. Further, a RELEVANT tool user guide can be downloaded on the REG website . RP NP, JK, GB, AC, LB, MT, EVG, MB, JQ, DP, all participated to the literature appraisal, design and testing of the tool, analysis and interpretation of data and manuscript writing, and approved the final version. NR and JC elaborated and coordinated the project. All authors read and approved the final manuscript. The authors would like to thank Katy Gallop, Sarah Acaster and Zoe Mitchel for their role in the literature review. The authors would like to thank the project management contributions in the later phases of this work by Naomi Launders. Finally, the authors would also like to thank all those who participated in the review and revision of the RELEVANT tool: Arzu Bakirtas, Turkey; David Halpin, UK; Bernardino Alcazar Navarrette, Spain; Enrico Heffler, Italy; Helen Reddell, Australia; Joergen Vestbo, Denmark, UK; Juan José Soler Cataluna. Spain; Kostas Kostikas, Switzerland; Laurent Laforest, France; Ludger Klimek, Germany; Luis Caraballo, Colombia; Manon Belhassen, France; Matteo Bonini, Italy; Ömer Kalayci, Turkey; Paraskevi Maggina, Greece; Piyameth Dilokthomsakul, Thailand; Sinthia Bosnic-Anticevich, Australia; Yee Vern Yong, Malaysia. JC -discloses prior Respiratory Effectiveness Group funding related to this study and has no other conflicts of interests to declare in association with this manuscript. RP has- no conflicts of interest to disclose. NP reports grants from Gerolymatos, personal fees from Hal Allergy B.V., personal fees from Novartis Pharma AG, personal fees from Menarini, personal fees from Hal Allergy B.V., personal fees from Mylan, outside the submitted work. JK has research funding from the U.S. National Institutes of Health and the U.S. Patient Centered Outcomes Research Institute paid to the University for investigator-initiated research. JK does not serve on advisory boards or have other potential conflicts of interest. GB has, within the last 5 years, received honoraria for lectures from AstraZeneca, Boehringer-Ingelheim, Chiesi, GlaxoSmithKline, Novartis and Teva; he is a member of advisory boards for AstraZeneca, Boehringer-Ingelheim, GlaxoSmithKline, Novartis, Sanofi/Regeneron and Teva. AC and RP have no conflicts of interest to declare in relation to these papers. LB reports no perceived COI. MT nor any member of his close family has any shares in pharmaceutical companies. In the last 3 years he has received speaker’s honoraria for speaking at sponsored meetings or satellite symposia at conferences from the following companies marketing respiratory and allergy products: Aerocrine, GSK, Novartis. He has received honoraria for attending advisory panels with; Aerocrine, Boehringer Inglehiem, GSK, MSD, Novartis, Pfizer. He is a recent a member of the BTS SIGN Asthma guideline steering group and the NICE Asthma Diagnosis and Monitoring guideline development group. EVG reports grants and personal fees from ALK ABELLO, grants and personal fees from Bayer, grants and personal fees from BMS, grants and personal fees from GlaxoSmithKline, grants and personal fees from Merck Sharp and Dohme, personal fees from PELyon, outside the submitted work. MB reports grants from GlaxoSmithKline, TEVA, Chiesi, Genentech, outside the submitted work. JQ’s research group has received funding from The Health Foundation, MRC, Wellcome Trust, BLF, GSK, Insmed, AZ, Bayer and BI for other projects, none of which relate to this work. Dr Quint has received funds from AZ, GSK, Chiesi, Teva and BI for Advisory board participation or travel. DP has board membership with Aerocrine, Amgen, AstraZeneca, Boehringer Ingelheim, Chiesi, Mylan, Mundipharma, Napp, Novartis, Regeneron Pharmaceuticals, Sanofi Genzyme, Teva Pharmaceuticals; consultancy agreements with Almirall, Amgen, AstraZeneca, Boehringer Ingelheim, Chiesi, GlaxoSmithKline, Mylan, Mundipharma, Napp, Novartis, Pfizer, Teva Pharmaceuticals, Theravance; grants and unrestricted funding for investigator-initiated studies (conducted through Observational and Pragmatic Research Institute Pte Ltd) from Aerocrine, AKL Research and Development Ltd, AstraZeneca, Boehringer Ingelheim, British Lung Foundation, Chiesi, Mylan, Mundipharma, Napp, Novartis, Pfizer, Regeneron Pharmaceuticals, Respiratory Effectiveness Group, Sanofi Genzyme, Teva Pharmaceuticals, Theravance, UK National Health Service, Zentiva (Sanofi Generics); payment for lectures/speaking engagements from Almirall, AstraZeneca, Boehringer Ingelheim, Chiesi, Cipla, GlaxoSmithKline, Kyorin, Mylan, Merck, Mundipharma, Novartis, Pfizer, Regeneron Pharmaceuticals, Sanofi Genzyme, Skyepharma, Teva Pharmaceuticals; payment for manuscript preparation from Mundipharma, Teva Pharmaceuticals; payment for the development of educational materials from Mundipharma, Novartis; payment for travel/accommodation/meeting expenses from Aerocrine, AstraZeneca, Boehringer Ingelheim, Mundipharma, Napp, Novartis, Teva Pharmaceuticals; funding for patient enrolment or completion of research from Chiesi, Novartis, Teva Pharmaceuticals, Zentiva (Sanofi Generics); stock/stock options from AKL Research and Development Ltd which produces phytopharmaceuticals; owns 74% of the social enterprise Optimum Patient Care Ltd (Australia and UK) and 74% of Observational and Pragmatic Research Institute Pte Ltd (Singapore); and is peer reviewer for grant committees of the Efficacy and Mechanism Evaluation programme, and Health Technology Assessment. NR reports grants and personal fees from Boehringer Ingelheim, grants and personal fees from Novartis, personal fees from Teva, personal fees from GSK, personal fees from AstraZeneca, personal fees from Chiesi, personal fees from Mundipharma, personal fees from Cipla, grants and personal fees from Pfizer, personal fees from Sanofi, personal fees from Sandoz, personal fees from 3 M, personal fees from Zambon, outside the submitted work. 13601_2019_256_MOESM1_ESM.docx Additional file 1. This file includes the goals of the Task Force, an intermediate item-reduce tool, and extended quality assessment tool pilot participants. 13601_2019_256_MOESM2_ESM.xlsx Additional file 2. This maps the quality recommendations within the primary reference papers Berger et al and Roche et al that resulted in an initial 43-item checklist. Global Asthma Network. The Global Asthma Report 2014. Auckland, New Zealand, 2014. Available online at: http://www.globalasthmareport.org/burden/burden.php. Patient-Centered Outcomes Research Institute PCORI Methodology Standards.http://www.pcori.org/research-results/research-methodology/pcori-methodology-standards. Accessed 02 Jan 17. European Network of Centres for Pharmacoepidemiology and Pharmacovigilance. ENCePP Checklist for Study Protocols. www.encepp.eu/standards_and_guidances/checkListProtocols.shtml [Accessed 02/01/17]. Respiratory Effectiveness Group website. www.effectivenessevaluation.org. Accessed 9th Nov 2018. European Academy of Allergy and Clinical Immunology website. www.eaaci.org. Accessed 9th Nov 2018.